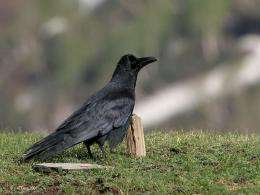 Large-billed Crow (Corvus macrorhynchos) in Kullu- Manali District of Himachal Pradesh, India. Image: J.M.Garg, Wikipedia. (PhysOrg.com) -- A new study published in Animal Behavior shows that crows are capable of recognizing symbols designed to represent different quantities and is one of many different studies currently looking at the behavior and intelligence of crows. The new study, conducted by a team of Japanese scientists led by Shoei Sugita from Utsunomiya University, looked at eight jungle crows. These birds are a larger, bigger-beaked relative to the American crow. The idea behind the first experiment was to determine if crows were able to determine which container held hidden food based on a symbol on the lid of the container. The birds were presented with two opaque containers, one with food and one without. The symbols used were the number two and the number five. The container with the number five on the lid was the one holding the food. When the birds were presented with the containers they had a 70 percent success rate in choosing the container with food. Other experiments changed up the symbols and used things like shapes and other numbers and the overall results found were that the crows were able to choose the symbol representing food anywhere from 70 to 90 percent of the time. Altogether, the researchers performed 20 different experiments. The study confirms, according to the researchers, that crows are able to distinguish between quantities of items. Other studies on crows conducted at the Utsunomiya University over the last few years have also determined that crows are capable of distinguishing between the human faces of men and women. Other studies are currently being conducted on the behaviors and intelligence of crows and the researchers hope the information learned will aid other researchers in designing ways to help control the crow populations in the larger cities of Japan where flocks of crows have become aggressive and bold enough to take food right out of a persons hand. We investigated whether jungle crows can select a given quantity of items (printouts of shapes and symbols) when simultaneously presented with smaller or larger quantities. We presented jungle crows with the choice between two sets of discrete homogeneous quantities (two versus five) in a fixed configural pattern during training. When crows could discriminate five items (15 out of 20 correct choices in two blocks of 10 trials each), they received control tests for non-numerical cues such as element configuration, shape, and total filled area and novel quantity (3 versus 5, 4 versus 5, 5 versus 6, 5 versus 7 and 5 versus 8) tests. During training, jungle crows learned the discrimination task relatively quickly. Additionally, the selections were generally not controlled by the non-numerical cues, indicating that the crows were responding to quantity. Jungle crows selected the familiar larger quantity in smaller sets (3 versus 5 and 4 versus 5) and the novel larger in larger comparisons (5 versus 7 and 5 versus 8) except that of 5 versus 6 quantities. These results suggest that jungle crows have a natural tendency to select the larger quantities and that decisions were affected by the numerical ratio and stimuli magnitude, indicating the use of analogue magnitude mechanism for numerical judgement, as is observed in other animals. It was very interesting, and combined with the above article, it goes to show that mankind is truly not as unique as we assumed as far as brains go. @Isaacsname How did you know they were picking their favorites? Because they chose the same thing from a selection every time, black and yellow bag of popcorn. Normally gulls will grab whatever they can, whenever they can, they're also very curious. In my home town in Ireland we have a tight knit family of Crows that has been in the same area for generations. The Crows have their own language. They converse about food, they squabble etc. They have words (sound pattern ) for "Cat" . They also teach the younger crows through demonstration. Maybe the Japanese should learn their lingo and "Cry Cat"
Crows are probably as smart as most inner city youth gangs, when I walk outside sometimes they start squawking their little heads off, and they change rhythm and tone when I do different stuff that they understand. One small species of tweeting birds even picks up patterns from human speech I think, you always hear their newest phrase from "tweet tweet.......TWEET!" to "tweet........tweet TWEET......tweet" etc etc, I really doubt it's random or a mating call, you can tell mating calls from rudimentary communication fairly easily. Try whistling at a chatty bird sometimes and see if you can understand how it reacts. Sometimes they actually tweet a sarcastic "Stoopid"
My cows can distinguish symbols, I go out to the paddock and hold up different signs for what I want the cows to do. e.g. I have a sign for move to the gate, another for hay time, another for move down the race. The picked up suprisingly fast all things considered. I believe animals, in some ways, are smarter than we give them credit for. The learn times of day habits and food sources pretty fast, even those that are supposed to be a little retarded. Man, I have a bird feeder next to my window with a small speaker from my computer mounted next to it. I bring up soundboards for all the various animals that come to feed, from birds to chipmunks. Very interesting reactions sometimes. You guys should try it. This comes as no surprise. Parrots are capable of distinguishing between symbols also. Studies have also shown that crows are capable of using tools. They may not look it, but certain types of birds are actually quite clever. There's even recorded instances of escaped pet birds teaching wild birds to talk, which is fascinating (if I could just find the article referring to this).